Was watching TV after returning from Ishqiya. The First look of Shyam Benegal's 'Well Done Abba' came up. To my [rather shocking] surprise, the promo itself had 'beeps'. The foul language. May I ask why?? Why a maker like Benegal would like to sell his product on such lines?? Similar compalint is here with Vishal Bhardwaj too. When he knows that his product is outstanding-as always, why does the foul publicity takes place? Aren't they losing audience by doing so?? Believe it or not [if you haven't seen the movie] - there are hardly five 'gaalis' in Ishqiya. [so people who are expecting a 'gaali'pedia, shall avoid the movie]. But the way the promos were designed, a nice share of audience is lost. Putting that aside, Ishqiya is such a fabulous example of movie making. Vishal has a franchise for Dark characters, Dark movies. And this is also travelling the same genre. Directed by Abhishek Chaubhey, Ishqiya is charming and at the same time a shocking movie. Charming in the way the love triangle is shown. The first half is so light hearted. And very well engaging. But as the layers of the story opens up one by one, viewers get shock after shock in terms of the story. Pretty neat narration indeed. Though the movie gets flawed during middle point of second half. Also the way the movie was set up, climax looks a 'bit' downer, but yet quite good. When the movie comes from Vishal's production, there is no two way about the technical superiority. Absolutely superb cinematography of North India. Even the small details are taken care of. Has anyone heard of 'Gogo ice cream'? well, Mohana Krishna-the cinematographer somehow manage to capture that small thing too. Or, the smoke of fired bullet-not from the gun but from the place where it has been shot. Perfect!! and not to forget the base-the dialogues written by Vishal himself. Are to die for. The lines are life of the movie. Witty and corny humor at its best. The music complements the mood of the movie completely. What you bring with yourself at home is lovely 'dil to bachcha hai jee' and haunting 'ab mujhe koi'. Close your eyes and you can see Vidya Balan. Such a powerful act of hers overhere. She is so confortable playing seductress who smoothly plans all acts. While one can never go wrong with Naseeruding Shah. He has the most adorable performance in the movie. Whenever he is on screen, we can't help but smile. Arshad Warsi is being repetative. But still he manages to get some highlights. All in all, Ishqiya is a movie that surely will engage you throughout its runing time. Forget some flaws given Abhishek is a first timer; a really nice effort. A must watch, and great start to the year 2010 if you haven't seen any movie in this new year. -''Sal is the man" - as fellow Twitterer @sakshijuneja puts it. Yes, he is the man. The He-Man of bollywood. Which he proved in Wanted. Continuing the reign, he promised same in Veer. Actually, I was anxiously waiting for the movie. Anxious-cause I know what Anil Sharma can deliver. I am not a fan of movie making at all. Gadar - to me was a well resourced movie but technical disaster. Somehow I can't connect all the 'loud' ness Anil Sharma has in his movies. But thank God, in Veer, there is some-i repeat 'some' relief. There is no Hindustan-Pakistan shouts. And to top it all-No Sunny Deol. This role could have easily gone to Sunny for sure if it did not have love story. But that's Sallu's genre for sure. That he can easily manage both-love and fight. He can look and act casanova and at the same time, he also can kick butts of baddies. The first half though, is watchable, Just because of Salman. He is perfect for his part. Pardon his 'specific' style of lip synching, its a treat to watch him even in anger...All scenes shot at London are enjoyable. So easily he walks on fine line of romantic and funny. ok enough of Salman [:)] The newbie-Zarin Khan is quite average. All she has to do is smile throughout the movie. She looks real bad clone of Katrina. During each scene, I wished if that was Katrina walking in such gorgeous wardrobe. Zarine looks too baby faced. Correction-farex baby face. Mithun is okay but Neena Gupta is bad. character is written so badly that such nice actress is wasted on suggestive movement dancing. On the other hand, Suhail Khan was quite good. In a role of goofy brother of Veer, he did good. Jackie Shroff is out of form. He should retire now. Veer is set in 19th century. But no - the movie holds no historic references. Its just a pure fiction based in times of English Raaj. Going by accuracy of portrayal of that era - Anil loses it all. But never mind if we don't expect that-cause after all , this is fiction, not a documentary. But due to shoddy editing, you start to yell at how the story develops. After Gadar, Anil has found new love of his life - Train. So somehow he tries to sprinkle scenes of steam engine chase. Which is badly choreographed. But on the other hand, cinematography by Gopal Shah saves us from sinking. But again, badly executed action scenes - especially bad wire jumps makes me shout. Okay, now take this- two warriors are named - Magan and Chaman. what can you expect more from the writing department? No doubt Salman shines in acting department. But story is not his thing. May be that can be a fault of screenplay and dialogue writers. The movie had all the resources, talents and budget but everything is wasted by writing department. Such long boring sequences about following the oaths taken, not to deviate from 'Vachan' are stretched to death. **spoiler** in climax a 'bore to death' scene shamelessly ripped off from Troy. Where father-son go sword fight in front of fort. **spoiler** We can see that Anil is sleep directing the movie. While having DVDs of LOTR, Troy, Titanic, Gladiator and the Mummy. But yes, I won't forget to mention beautiful art direction. From costumes to palaces, everything was so much gorgeous. So I would suggest you, if you are a fan of Salman AND masala movies - this movie is for you. But yes, for timepass. Don't expect "Movie Magic" or some serious lessons of History. Fav Scenes : Beautiful Rajasthan captured, the climax shots of Jodhpur Fort. Surili Ankhiyon waale .. Note: Words described here are solely personal thoughts. I may be wrong at places. Corrections and suggestions are welcome. Maula, Khuda, Ali, Khwaja - Names related to Islam. The words, which are used frequently nowadays in our music. 'Islam' itself means 'to submit, surrender or to accept'. And the songs, all reflects the same. The words says that I'm all yours my almighty, whatever I'm is because of you. You are the beloved and protector. You are the 'only one'. Help us to come out of this unfaithful world. Urdu/Sufi has such lovely feel in its devotional songs/poems. It speaks, directly to the almighty. It says directly everything to God. For example, 'Piya' Haji Ali or 'Mere' Maula or 'Mere' Khwaja, all songs have the 'possessiveness' which I love the most. Now, word of caution here. This doesn't make me deviate from my own religion - Hinduism. Hinduism is a belief that can not be defined. But it teaches you to believe in belief. Believe and respects others beliefs. That exactly is what I'm doing. Last Sunday, while visiting Dargah of Khwaja at Ajmer, Rajasthan - I had this playlist. What an awesome experience it was. Here are the songs that I love the most. I have somehow restricted myself to the mainstream songs. Because the list can go longer if I incorporate 'the' sufi songs. As usual, the list is in random order. Maula - literally means 'the protector'. Also it has the meaning of 'Master'. Here the protagonist requests his 'Maula' to mend his destiny. The song talks about realization that when I came to your sight, I found 'myself' from within. The lyrics written by Prasoon Joshi makes deep impression on listener. Lines like 'Sajde mein rehne do, ab kahin na jaunga, ab jo tumne thukraaya, toh sanwar na paunga' - Let me be under your kind eyes, if rejected, I will not be able to survive. And the most favorite lines of mine - 'Jab tu Ru-ba-ru aaya, nazarein naa mila payaa, Sar jhuka ke ik pal mein, maine kya nahi paaya' - When I found you in front of me, I couldn't match eyes & by bowing my head, I found everything. The lines are sure to make lump in throat. And superb composition by Rahman-the master of Sufi leads the song to a new height. Javed Ali and Kailash Kher outperforms. Al Madad - means asking to almighty for help. In the movie help was required to come over the darkness. Darkness abound by rule of foreigners. The song has a dark feel. To describe pain of people, Javed Akhtar uses effective lyrics. The song talks how the anger is rising amongst all and how dedicated the martyrs will be. And ends with lines - Qaid Se Azaad Hoga Kya Junoon Ek Din- Rang Layega Deewane Ka Khoon Ek Din'. Recitation of word 'Maula' by Rahman leaves you speechless. Kailash Kher, Murtaza & Kadir provide excellent support to the song. Amit Trivedi's one of the first works. Who later delivered smash hit like Dev D. with lyricist Amitabh gives this awesome soulful Qawalli for the movie Aamir. Quite altered version of Qawwali - featuring (again) Murtaza and Quadir Khan, Amitabh and Amit Trivedi. Song describes how the protagonist's light of life is fighting against strong winds. It urges Khuda - to keep his kind shelter, upon him, keep him backed as he is fighting on his own. It talks how fragile the string of life is, how the fake joys of life are short living and where actually the happiness lies. And lastly the words about Khuda, that how almighty you are - kya majaal teri marzee ke aage… bando ki chal jayegi… thaame ungli jo tu kathputli bhi…chaal badal jayegi. Minimal sounds and maximized vocals make this track awesome. The song is dedicated to Hazrat Khwaja Ghareeb-un-Nawaaz of Ajmer [Rajasthan, India] - descendant of Hazrat Ali, who was the son-in-law of Hazrat Prophet Muhammed. Again Javed Akhtar And A R Rahman team up for the divine track. One of the best works Rahman ever did. [this can be used for all such songs of Rahman, where he outshines himself]. A qawalli blend with devotee's dedicated words. Song has got an amazing picturization. And the way it concludes, with Shehanshah Akbar himself watching divine light and dancing along with Qawwals. Amazing feel. 'Tere Kadmo ko mere Rehnuma nahi chhodna ganwaraa...' - It doesn't feel right to leave your side o my lord. Another song dedicated to Khwaja of Ajmer. Its a wonderful classical piece. The song is about sadness due to distances between the two protagonist. And pray to meet beloved.Sung and composed by Nizami Bandhu alongwith Sameeruddin and Abhishek Arora - the track is haunting. I wonder why such talents do not come up in mainstream cinema. I can easily put Meenaxi under top 5 albums of Rahman. Here MF Hussain himself writes a great Qawwali about Light of God. And as vibrant his visuals - words of Hussain complements them. Sample this - "parindon se poochha...parindon se poochha kahaan parwaaz hai; khamoshi se poochha kahaan aawaaz hai; phoolon se patton se rangon se aayi sadaa...noor-un-ala". Though the song doesn't clearly states its all about praising the almighty. Noor-Un-Ala means 'the grand light'. But the depiction of lyrics, clearly makes it a praise to Allah. Also Nur is one of the ninety-nine Attributes of Allah. Add beautiful Tabu as visual delight and superb rendition of Murtaza and Quadir Khan - Rahman does it again !! 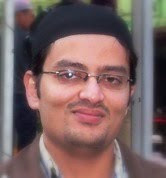 Haji Ali. One of the most famous saint of Islam. And no doubt Khalid Mohammad chose Rahman for the song about Sayed Peer Haji Ali Shah Bukhari. Fondly called Haji Ali. This is perhaps first sufi song by Rahman. And still it keeps returning on my playlist. Rahman gives his heart for the song alongwith Ghulam Mushtafa and Srinivas. Written by Shaukat Ali - the song beautifully captures aura of Haji Ali. The song is so powerful that can make non believers-believe. Rahman the Great. Again. With pretty unknown name for Lyricist - Raqeeb Alam. A simply outstanding 'Hamd' - a poem in praise of Allah. No words are enough for this shear beautiful lyrics. A charming melody that Rahman rarely composes, and his voice - enough to make you soak in subtle feeling of divinity all around you. No one can describe this song better than our very own theBollywoodFan. (Refer to his excellent post). Guitar strings. And a new voice. Kailash Kher's claim to fame. With minimum music arrangement by Paresh-Naresh. Penned by Sadaquat Hussain, the song easily goes to Kailash whose vocals makes it so special. Song talks about not go ranting on what has been lost and rejoice cause it will come again, in a better way. How can this list be complete without H.R.H. of Sufism - Nusrat Saab?? This is third song on this list which mentions Khwaja ji of Ajmer. The song was at crucial time in the movie. And shot perfectly at the dargah. (or was it a set at filmcity??) Nusrat Saab alongwith fabulous chorus makes this qawwali written by Anand Bakshi- a perfect one. Sung flawlessly by Rashid Ali, penned amazingly by Abbas Tyrewala - the song takes 'Hamd' to another level. Here, the protagonist is feeling sorry about how he forgot the God. Words used here, 'Pyaare Khuda' makes it so much personal. Makes Khuda very possessed by the protagonist. And quite tricky words like Hayaat Qayamat ki yaa hai Qazaa.. make it more absorbing. Wonderful composition by Rahman which sounds like Opera. (Read translation at tBF's Blog). Also see the video linked under song's name, it has got some fabulous pics of Bandagi. 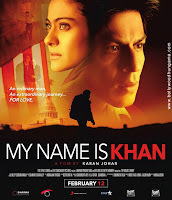 When piercing voice of Shankar Mahadevan, heard in first promo of My Name is Khan - I was sure that this is going to be one hell of a soundtrack. Given my increasing inclination for Sufi, I would say this is surely a treat for me. And as promised - Shankar Ehsan Loy once again delivers a superb soundtrack to start year 2010 in a musical way. Though right now I am going through other songs as well, I can't resist myself to put up words for 'THE' song - Noor-E-Khuda. Sung by Shankar Mahadevan, Adnan Sami and Shreya Ghoshal. A song which will surely bring tears [atleast to me] in this sure shot tear jerker movie of Karan Johar. Though lyrics of Niranjan Iyengar left me hungry for more deep words, cause here just for rhyming sound I think he has taken easy picks. Like Zard-Sard and more. But the way song is composed, left me speechless. The 'antara' of Shreya Ghoshal would be 'must watch' in the movie. And as the song concludes, Shankar Mahadevan in his own style, leaves his mark. And for such song, choice of Adnan Sami is a bit surprising. But he does his part perfectly. Yun naa humse nazarein firaa. Wishing all my Blogger Buddies and Readers a very very happy new year. Hoping a great new year ahead for music and movies. 1. Luck By Chance : Movie about Movies. The Best theme that can please me. Subtle smoothness was all around in each frame. Every time we get impressed by Charisma of superb cameos of *stars*. Even the most delightful performances. Memorable scene was of Hrithik when he does interact with street children from his car window. Just superb wordless scene enough to make us speechless. Love Rewatching this masterpiece again and again. What I loved more about the movie is its ending. Where it doesn't make any typical solutions but straight ending. Also not to forget, Shankar Ehsan Loy's stirring soundtrack. Can't wait to see more films by Zoya Akhtar. 2. Kaminey : Never I am a fan of action or even angry young man movies. But this movie made me fall flattered at vision of Vishal Bhardwaj. Such a dark movie yet full on with colors and shades of its characters. A complete revelation of actor Shahid Kapoor. The movie will definitely get tonnes of awards for him. New talents like Chandan Sanyal and Amol Gupte shined up in each scene. Even Priyanka Chopra portrayed Marathi Mulgi with great confidence. And when vishal is giving music too, you can't have any doubts. 3. Delhi-6 : It could be the no.1 but given some flaws and the weird climax, it is at 3rd place. Serene Rahman melodies are the soul of the movie. And add divine beauty - Sonam Kapoor, Allah, this is a visual feast. [check out the awesome music+visuals review at Sujoy's blog ]. The best enemble cast after Luck By Chance. Just read that Rakeysh has changed teh ending and now it will show Roshan, dying in the end. So now, it will be a perfect movie. 4. Dev D : Cult, Mean and Extreme. Are the three words to describe the movie. It shattered all age old 'goodness' of the Devdas story. Never on screen, things are so stripped. The performances were superb. And the technical expertise made movie look stunning. Abhay Deol alongwith 2 new girls outshined with performances. A strong dillema will surely be there for award chosers, between Abhay and Shahid. Not to forget fantastic soundtrack by Amit Trivedi-18 tracks which drives movie on its own. Love it. 5. RocketSingh - Salesman of the year : Posterboy of the year. Ranbir Kapoor. After charming Wake Up Sid and Ajab Prem ki Ghazab Kahani, the guy again proved that he has the genes. And is here to stay. A simple little movie which revolves at just two places. Goes through life of a few characters working in an office. And some hard hitting facts of life. Rocketsingh works perfectly with honest intentions. Shimit Amin's shines in his third movie too. Way to go. So these are the Top 5 movies. There are still some movies that needs to be mentioned. So can't resist to make this list longer, and here are another 5 films that are must watch. 6. 99 : Another low budget, low expectation movie which left everyone laughing and laughing. Kunal Khemu and Soha looked great together. And Boman + Mahesh Manjrekar rocked movie with their performances. 7. Wake Up Sid : A movie that doesn't shout about boy being younger than girl. A movie that feels light and cool like breeze of air. A movie where Ranbir proved himself, again. 8. Gulaal : Another hard hitting movie by Anurag Kashyap. Just watch this movie for KayKay's performance and awesome songs of Piyush Mishra. 9. Wanted : Love Me..Love Me..Love me... Sallu says you love me. Yes, I do. So do I for Aayesha. The movie literally rocked. A perfect Masala Entertainer. 10. Quickgun Murugan : The Legend came alive again. Out and out hilarious movie. You just can't help but to laugh at stupid - funny caricature of the cowboy from down the south. So, what are your favorite, in order of 1 to 5 or 10? ?